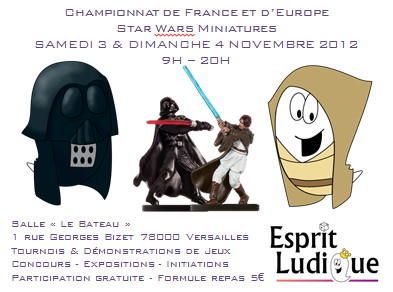 The next French/European Championship 2012 is planned the 3rd and 4th November in Versailles ! No limitation of a figure (exemple 1, 5,10 Mouse or more are OK). - Virtual Set you can play : Destiny of the force, &, Renegates and rogues. Virtual Set not allowed : Epics, V-Set 3 & 4. - Figurines des V-set : Obligation to play with the printed figure. Possibility to customise the "right" figure (printed). Obligation to customise (to identify) if V-set and Official "same" figures are on the same team. (exemple : Branna et des Echani Handmaiden). - V-Set Printed Cards : Try to have a good printed card to read easily the abilities. It is not an obligation to play with the US cards (swmgamers). FAQ et errata : All, official and v-set (just before the V-set 3). Main information : Soresu Style Mastery = non-melee & melee (Obi Wan et Darth Zannath). Getting better opening the field up. Will Critdu win the day and take his frenzy global? Looks good guys, glad you guys are coming around allowing the vsets in tournament play. hope all goes well! So no Battle of Theed or Cantina Brawl mini v-sets? With no Battle of Theed sets allowed, they remove one of Mace's biggest counters (Naboo Deathshots). It was a real pleasure to welcome French, German and Belgium players. Some usual players can not come this year, but new guys and players of first sets were presents!!! Congratulations to Champions, to all players. Attakus,Afswm, Delcourt, Fungames, Hasbro, Ludikbazar, Troll2jeux. Now is time to wait 2013.... a new hope for french players! But the more important is to have fun, two final pictures before to split. Last edited by ADX on Thu Nov 08, 2012 11:28 am, edited 3 times in total. Congratulations to the winners. And congratulations to the organizers for getting such a fantastic turn out. That is eye popping prize support! Stormcommando's win First and Second. Looks like the European players love to play Empire. Top 16 dominated by 3 squads, Stealth n Blue, Weir and GOWK Mace. Perhaps a more information about the teams. No Mandaloirain this year for the tournament. Empire 09/35, all teams with Thrawn, 5 with Cad Bane, 3 with storm commandos, only one player was not qualified with Nym and mercenaries. Rebel 04/35, one team with Luke cdo / Solo s in final phase, 2 others with Solo armor & vet cdo, one with Yoda of D and Luke cdo. Old Rep 03/35, one team with Bastilla & Alto for final phase, the 2 others with Bastilla/Atris/carth O.
it was the selected option. News figures were used, thank to you for these virtual miniatures. And you are right, very very big Thanks to our partnaires. We have very good relations. It is a long work to reach these prizes (and many no response of other "sponsors"). But the target is OK for a free tournament with 2 days of prizes. I really hope that one day other foreign players will participate to our European events in Germany or France. Yes for this tournament and the format (Vset 1 & 2), Stormcommando was the team to play !! I play with Sylvie (Player of the Paris group) a version with the New Thrawn. Jari with the Old Thrawn. Round 1 : A the end of the turn, a Gran (or Rodian) run 12 cases. Switch by Nightsister who run 12 cases. Round 2 : The night play move 6 cases and make a Force Ligthning against the turtle => R2-D2 and Gungan are Dead (it's cool direct dommage) !! This combo run very well and have surprised a lot of player !! I expected a lot of Critu/GOWK and some Thrawn Swaps. So I went with something that could disrupt, steal Stealth and had Accurate Shot for 30+ damage (bye-bye R2!). I came up with Rebel Commandos, Leia of Cloud City and Smuggler supported by a bunch of Diplomats. Unfortunately I lost my first match against Ein_elf (the winner of the tournament) who played Storm Commandos. But it was very close. At 15:10 for him I tried to shut him out of the gambit zone with my Caamasis and Crix, so I would win 15:15 because I was nearest to the middle. His only chance was to shoot Crix with Weir. He hit twice and I failed both Evades. The other match I lost was against Khamal's Bane/Arica Swap. I sacrificed Crix and levitated Salacious Crumb next to Bane. A gamble, yes, but I had to do something about the space cowboy. He used both Admirals to kill Crumb. Both hit, I only evaded one. With Crumb dead Bane survived with 40 hit points and the game was over. Otherwise I won all other games, though never in time. Against Critu/GOWK I killed the support pieces and ignored the big guns by blocking them off with Diplomats. After a 4 years break from grand tournaments I am quite pleased with my 5th place (7 wins, 2 losses). I had no easy matches, because my squad lacked fire power, but it always had a fighting chance, so it was probably the right choice for me, since I wanted to avoid mirror matches. See you next year, guys, and thank you for a great tournament!